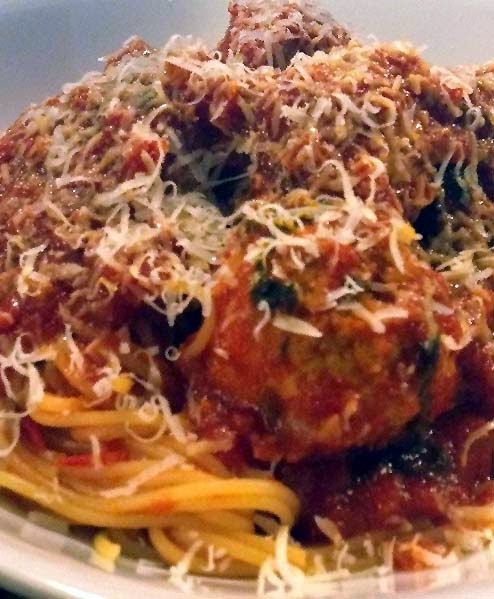 These chicken meatballs can be added to any pasta and sauce dish such as spaghetti. They're simple enough to make and very delicious. Preheat oven to 450 deg F.
In a large bowl, combine all ingredients and mash it up with your hands. When thoroughly mixed, begin making 1 inch balls and arranging them on a baking pan. Bake for 10-15 minutes. Mix with your favorite pasta sauce and serve. If you're cooking pasta sauce from scratch, it's good to simmer these chicken meatballs with the sauce for 30 minutes to an hour before serving.